Action gameplay with puzzle mechanics. Is there a better alternative to Land-a Panda? Is Land-a Panda really the best app in Puzzle category? Will Land-a Panda work good on macOS 10.13.4? Land-a Panda….The world's panda population is in decline, and your help is needed! Assist the lovestruck Yang Guang (male panda) to meet with his dream partner Tian Tian (female panda), in this highly innovative puzzle game. With a unique gameplay mechanic, a wide variety of levels, and beautiful High Definition graphics, Land-a Panda is one App Store title you won't want to miss! 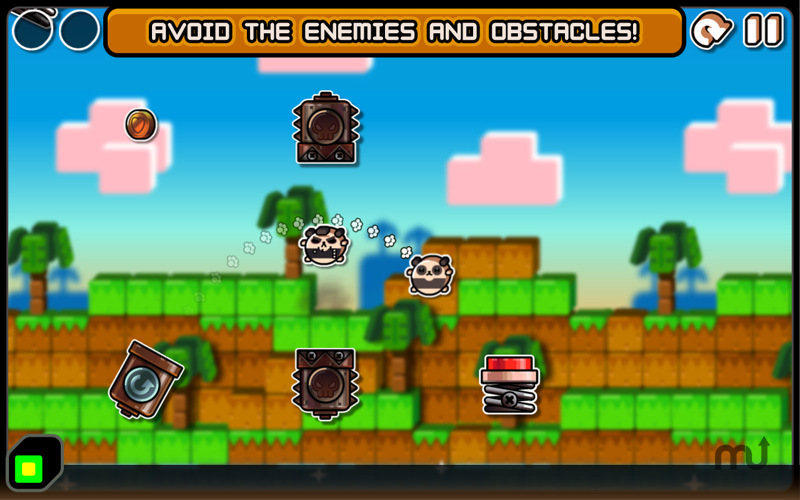 Our latest update adds an entire new world to the game, The Panda Desert, containing 20 brand new levels. Also included with this update are 3 new achievements to unlock, and a few minor bug fixes. Land-a Panda needs a review. Be the first to review this app and get the discussion started! Land-a Panda needs a rating. Be the first to rate this app and get the discussion started! 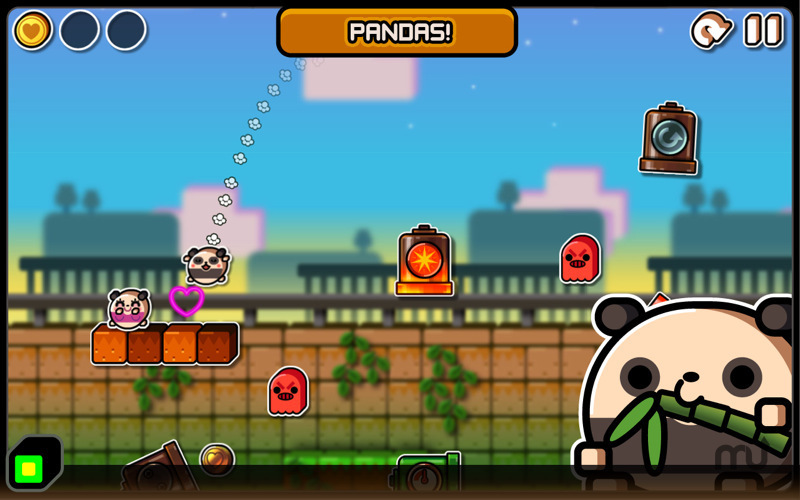 Land-a Panda combines fast action based gameplay with puzzle mechanics, and a simple and intuitive touch control system. Launching Yang Guang from a cannon is as simple as tapping on it, although as you progress more complex objects are introduced, making your timing and planning ever more crucial. Unfortunately it's not quite as simple as getting Yang Guang to meet with Tian Tian. If you don't collect any of the golden love coins on your way, Tian Tian will not be impressed! To get maximum points (and love!) 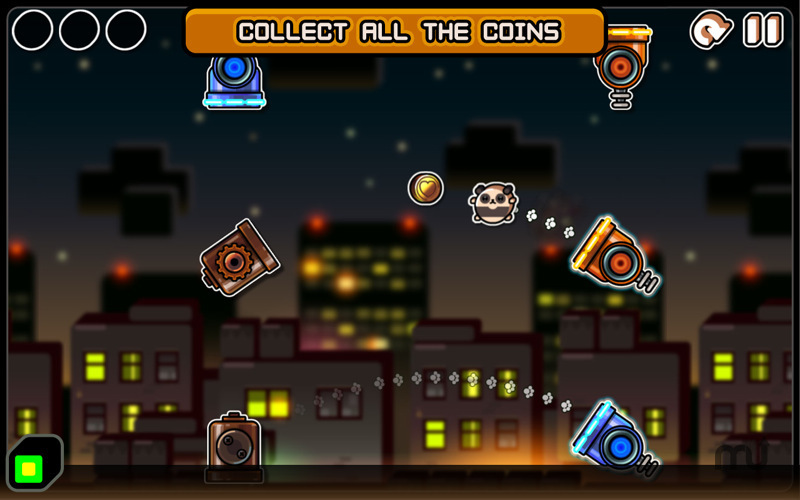 you must collect all three golden coins in each level, while avoiding a variety of enemies and obstacles along the way. Reaching Tian Tian will not always be easy, with a multitude of different cannons and obstacles to traverse Yang Guang through in order to reach his soul mate. From moving and rotating cannons, to teleports and spooky ghosts to avoid, you'll need to master a number of skills to impress this fine lady. Yang Guang will travel through a number of different worlds, each of which is presented in bright and colourful High Definition graphics. 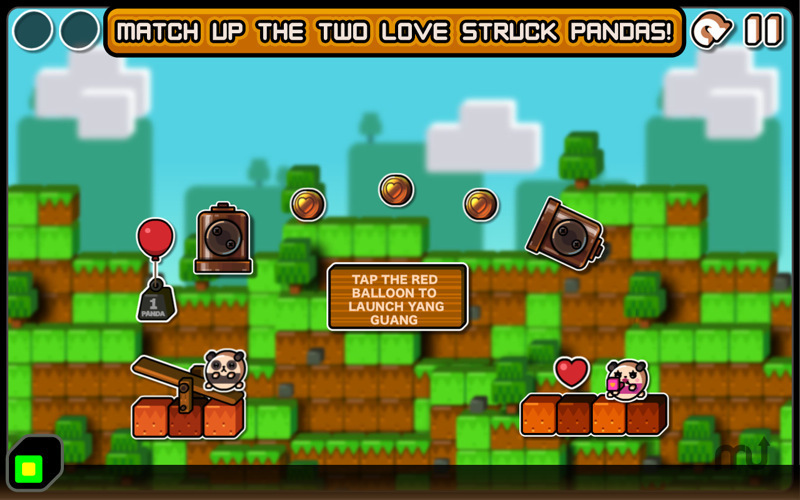 Easy to learn but difficult to master, can you collect all the golden coins and win the heart of the gorgeous Tian Tian?